Nemo and Dory aren't the only fish in the cinematic sea this June. 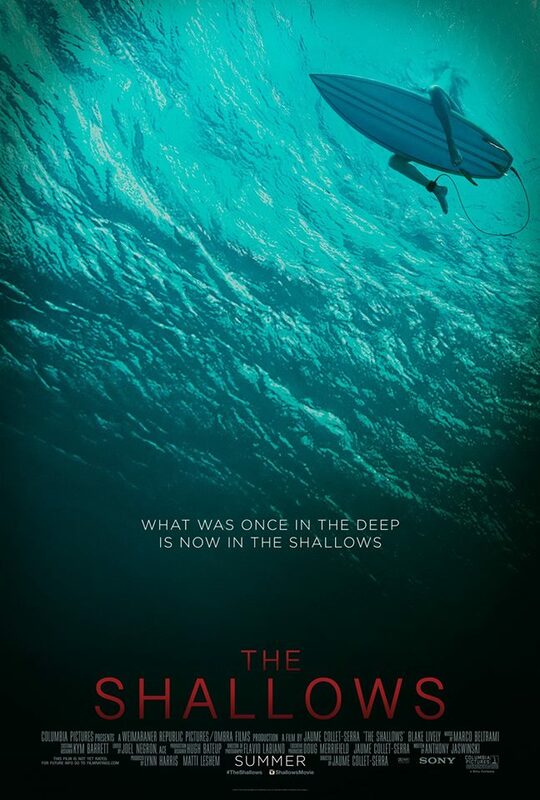 As surfer/ex medical student Nancy (Blake Lively) learns the hard way, there's also a hungry bull shark lurking in THE SHALLOWS. Still grieving the loss of her mom to an unspecified illness, Nancy tries to find solace at a secluded Mexican beach that was special to her mother. It's a beautiful location that easily lives up to her driver's description of paradise. Nancy doesn't quite have the spot to herself. There are a pair of local surfers there, as well. She's a bit cautious at first, but soon warms up to her fellow wave riders. However, when they leave as the sun is setting, she opts to stay behind to catch one more wave. This turns out to be a bad decision when Nancy finds herself a little further out than expected. The discovery of a partially eaten whale doesn't bode well, either. At this point, the film turns into a taut survival horror/thriller as Nancy gets bitten in the leg by the same bull shark that took out the whale. She manages to escape, bleeding but still in one piece, to a tiny island. Shore is in sight, but it might as well be a million miles away with the enormous ocean predator swimming around. Nancy is at least able to put her med school skils to use, tending her wounds with some improvised first aid, but escaping the deadly hunter in the water won't be easy. 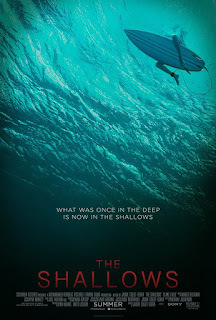 THE SHALLOWS follows Roger Corman's tried and true formula for a successful exploitation movie to a "T". It boasts a strong, intelligent female protagonist who doubles as both feminist heroine and objectified eye candy. There's some degree of subtext and social commentary – an early scene pokes fun at its American protagonist glued to her cell phone as gorgeous natural scenery passes by, and the central theme is one of coping with, and moving on from, loss – but never at the expense of the action and suspense. Director Jaume Collett-Sera has caught my attention before, making subpar material like HOUSE OF WAX and ORPHAN almost worth watching. I've been hoping he might get something worthier of his talents, and with THE SHALLOWS he has. Don't get me wrong, this is still a relatively silly film, and despite all the pains it goes to show its heroine being smart and thinking her way out of the tough situation she finds herself in, much of it is still highly implausible. But it's fun and efficient and for the most part works. What more do you really want out of an unpretentious little shark movie? 3 out of 4 stars.